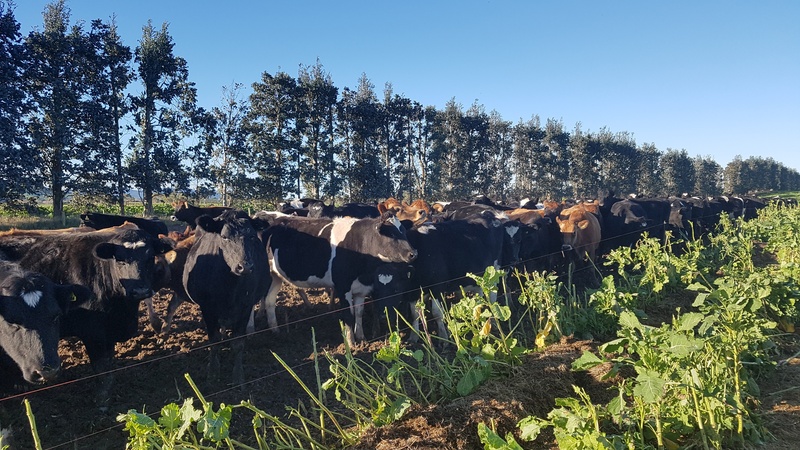 Managing a self-contained dairy farm with 1,200 cows, and rearing all the calves on his farm for beef as 2-year old's leads to quite a busy life for Paul. This winter he'll be wintering 2,300 cattle, mostly on Kale and fodder-beet supplemented with grass silage fed out in the crop, so when it came to choosing a silage wagon, there was one key thing that Paul needed, most - ground clearance. the crop and mud in Southland conditions"
Hustler's new range of Side Feed Silage Wagons, have massive ground clearance a massive advantage over other forage wagons thanks to the unique single piece body and integrated chassis design. Not only does this provide the class-leading ground clearance by a country mile, but it also makes for a higher strength to weight ratio, eliminating stress fatigue points and cracking making for a longer lasting wagon without excessive weight. Why do you need more ground clearance? Easy operation when feeding in winter, and the crop isn't getting snagged on the wagon leaving a mess down the laneway. Thanks to the unique design all Hustler feedout wagons and silage wagons come to scale ready, where the load cells are protected in the towing hitch and axles where they're less exposed to damage. Being scale ready allows operators to invest in the best silage wagon at an entry-level price, then as the farm grows or the demand is required to measure the amount being fed, a wireless or hard-wired scale option can be added at a later date without the need to replace the wagon.